How to address the City of Edmonton’s Mayor? Why flags are flown at half-mast or raised to mark special days? You can request a military retirement letter from our military liaison, with the Edmonton Salutes Committee? The Protocol Office provides leadership and order to proceedings for the City's ceremonial, protocol and diplomatic activities. The Protocol Office strives to profile the City in a politically and culturally sensitive manner. 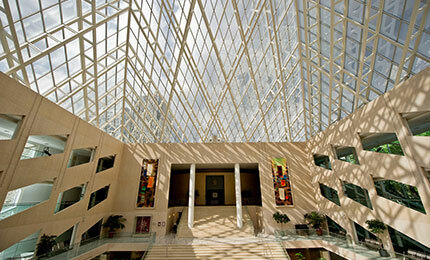 This Office supports a portfolio of events, activities and services that benefit, promote, celebrate and enhance the City of Edmonton's reputation. Note: In conversation or at official occasions, use "Your Worship"; less formal is "Mayor Iveson". Note: In conversation or at official occasions, use "Councillor Last Name"
* The Lieutenant Governor of a province has the title "Honourable" for life; the courtesy title "His/Her Honour" is used only while in office. My dear Lieutenant Governor: "Your Honour"
* The courtesy title "His/Her Honour" is used only while the Lieutenant Governor is in office. Dear Mrs./Mr. (name): "Your Honour"
* The title "Honourable" is used only while in office, unless he/she is a member of the Privy Council. "Mr. /Madam Premier" should not be used. Note: A cabinet minister does not retain the title "Honourable" after tenure of office unless he/she is a member of the Privy Council. The term "Mr. /Madam Minister" should not be used. Dear Colleague: (between colleagues) "Minister"
Dear Mr./Madam Justice (name): "Mr./Madam Justice (name)"
* The title "Honourable" is now recognized for provincially appointed judges. The courtesy title "His/Her Honour" is no longer appropriate given an official title has been granted. Dear Chief Judge/Judge (name): "Judge (name)"
The Order of Precedence outlines the order people would speak at special events in Alberta. Precedence may vary depending on the event. For further information please contact the Protocol Office. The Table of Precedence for Alberta lists categories in their order of precedence as they apply to ceremonies and occasions of a provincial nature. At provincial functions where federal, foreign or diplomatic dignitaries are present, circumstances may dictate that provisions of the Table of Precedence of Canada or international rules of protocol be observed thus giving these dignitaries precedence over certain provincial categories. Information on protocol for national ceremonies is available on the Heritage Canada website. In the absence of the Lieutenant Governor from the Province or his/her inability to carry out the duties of Lieutenant Governor for any reason, the Administrator of the Province takes the Lieutenant Governor's place of precedence. Flags on City buildings and spaces may be lowered to half-mast to commemorate special dates such as Remembrance Day, as a measure of respect and condolence when a high profile official passes away or as per protocol recommendation. The location of the position of honour depends on the number of flags flown. When two flags (or more than three flags) are displayed, the position of honour is furthest to the left. To an observer facing the display, the Canadian flag should be on the left and the City flag on the right. When three flags are flown, the position of honour is in the centre. From the perspective of the audience facing the flags, the Canadian flag should be placed in the centre, the Provincial flag on the left and the City flag on the right. The Canadian flag should not be flown on the same flag pole as any other flag, according to Heritage Canada. It should not be subjected to indignity or displayed in a position inferior to any other flag. The flags of other sovereign nations in alphabetical order. When there are more than three flagpoles, the National Flag of Canada should be flown on the left of the observer facing the flags. An additional National Flag of Canada may be displayed at the end of the line if desired. Non-profit or charitable groups may apply to have their flag raised by contacting the City's Civic Events Office. If approved, these flags may be flown for up to one month on the "Community Flag Pole" located on the southwest corner of the City Hall Plaza near the Cenotaph. 1. Flags of nations recognized by the Federal Department of Foreign Affairs upon request, on its national day of an anniversary of a special occasion. 2. Flags of non-profit or charitable organizations may be raised upon request of up to one month. 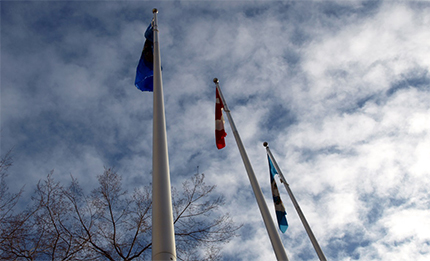 The Canadian flag, Provincial flag and City of Edmonton flag are flown on the official flag poles in front of City Hall. These flags are 3 feet by 6 feet or 0.90 by 1.80 metres. More information about flag etiquette is available on the Canadian Heritage website. Want to make someone's day? Submit a request for a special proclamation, letter, certificate, or a unique message from the Mayor.